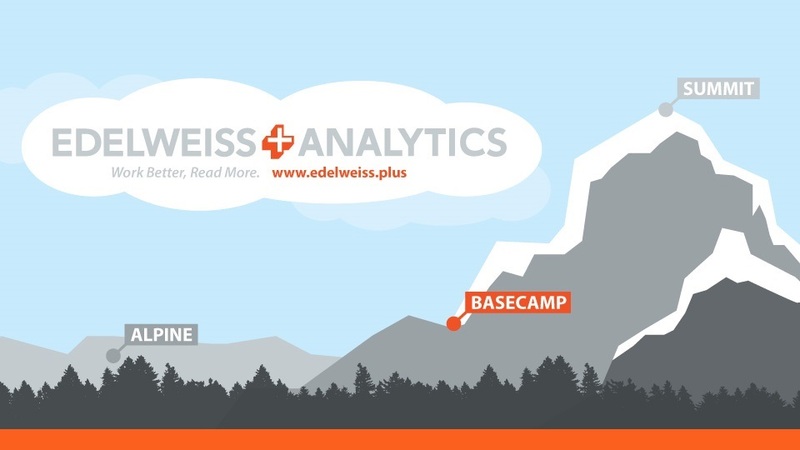 Edelweiss+Analytics is compatible with most ILS platforms, but the following ILS users are eligible for a free trial of Basecamp! With Basecamp and Summit, your library will receive this assessment on a regular basis to benchmark performance, monitor trends, create action plans, and share progress with your board. 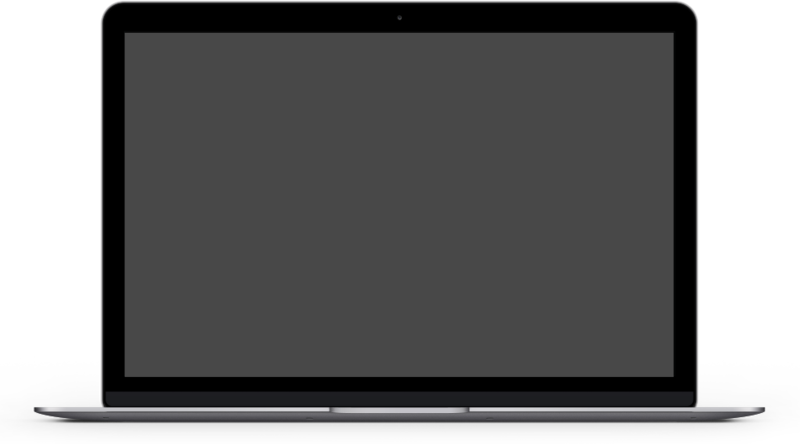 Our ILS integrations make it easy! No patron-level data is needed. 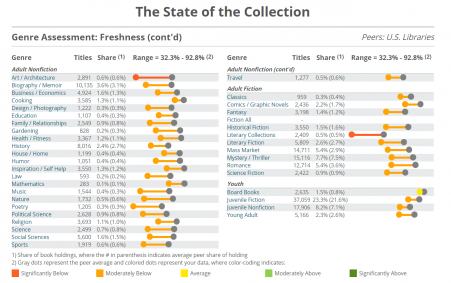 How does your book collection perform over time on key metrics? Benchmark against the performance of other public libraries and gain insights from independent bookstore sales! Breakout the overall assessment by genre to drive action planning! What portion of your collection has been active in the last year? How have your new titles "hit" compared to your peers? How does your collection compare when it comes to ownership of retail top sellers? How many times does your collection turn over annually compared to peers? Compare genres to one another based on peer benchmarked performance, identify strengths and opportunities, and prioritize your efforts. View a detailed analysis for each genre to identify opportunities for improvement and drive action planning. Compare your percentage of holdings to the average peer share to identify areas of discrepancy that may highlight opportunities. View the top selling titles in the regional or national peer group of your choice. Check out the most in-demand pre-publication titles in the peer group of your choice. Immediately identify which popular titles may be missing from your collection. Check marks immediately identify whether you have a title in your collection (green) or on order (yellow )! 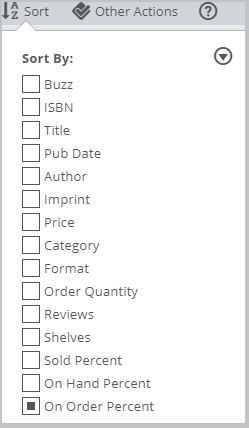 In the green bar, view what percentage of libraries have circ'ed the title or have it on hand or on order. Switch to a retail peer group if you'd like to see what is selling well at independent bookstores across the nation. On the right side, see whether any of your locations have the title and how many copies. Choose a regional or national peer group to view market data for each title. 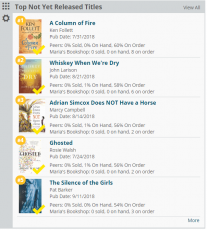 Check out what bookstores are ordering right now! 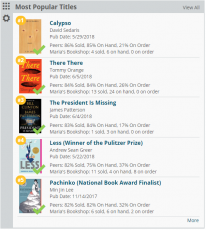 Sort lists to identify the most in-demand titles you may have missed! Make Edelweiss+ Your One-Stop Shop! When you create orders, do you have Edelweiss+ open in one window and your ILS in another? 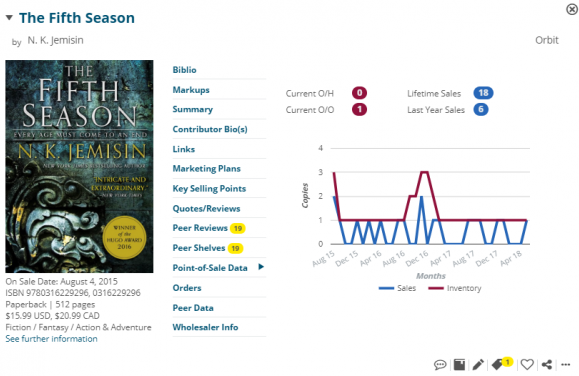 Selection decisions are fast and easy when you can see your library's circulation history and current holdings for each comp title right in Edelweiss+. Quickly see how the title circ'ed in the first three months after release, lifetime, and last year as well as current on hand and current on order. This data can help predict the demand for an upcoming title. 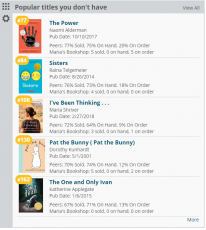 Looking at a title in Edelweiss+ and curious if you currently have it in your collection? Or have circ'ed it in the past? Enjoy a one-click view of your ILS data. "Our budget is limited, but so is our time. This helps us make the most of both, and really gives us something to show our board." "The State of the Collection report tells us how we're doing compared to peers, and then I can take action with Edelweiss+Analytics." "I never realized how useful it would be to learn from other libraries AND independent bookstores." "It's hard to know how well we're really doing and how we can improve. These tools make it so much easier." A simple upgrade to your Edelweiss+ user account that means you'll never miss a new title! See what's on-order, on-hand, and circulating/selling at libraries or bookstores! Integrate your ILS data into Edelweiss, which is super easy with our ILS integrations. 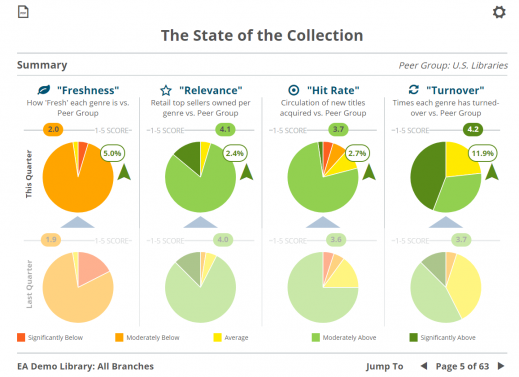 Receive the State of the Collection report, and track performance over time! Stay a step ahead of circulation trends, identify over- and under-stocked areas, compare locations and collections, experiment, create weeding lists, and much more!